The New York Times better figure out what it thinks of commedia dell’arte, especially as it relates to Giorgio Strehler’s famous production for the Piccolo Teatro di Milano of The Servant of Two Masters (aka Arlecchino). First Margo Jefferson, in her infamous “primer” for the uninitiated lumps it together with the avant-garde. Then Charles Isherwood pays the backhanded compliment of making Homer Simpson jokes. What neither seems to grasp is that, in this production at least, commedia is not just popular, but populist theatre. It is also not at all elitist, pace Jefferson—but when appropriated by as revolutionary a director as Strehler was, it can be an utterly serious medium for joyful theatricality. That something more than pratfalls is going on should be evident to any observant playgoer within the first ten minutes. 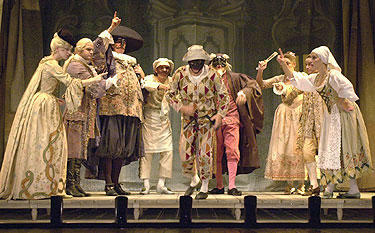 Goldoni’s play is performed within multiple “frames” of theatrical context. The stage setting consists of a small raised platform (probably no more than 250 square feet) surrounded by an airy eighteenth-century courtyard. As introduced to us, silhouetted beautifully through a simple white draw-curtain, the cast is not just Goldoni’s dramatis personae, but a troupe of players from another era. And since there is more “offstage” space than “on,” what we see is not just a play but their machinery—mulling about, making sound effects, preparing props and costumes. The clincher in this concept is the prominent positioning of a white-haired “prompter” (who the program tells us is Piccolo Teatro’s real prompter!) who is consulted often and strategically interrupts the proceedings—usually when the fictitious “actors” lose their lines amid too much genuine emotion. (Fulfilling Strehler’s alienating aesthetic, the prompter device allows us to be teased with sentimentality only to have it cut off with a reminder of artificiality.) Sometimes the prompter helps, too, by encouraging us to indulge a hammy actor with applause, for instance. Strehler continues breaking his own elegantly crafted frame throughout. The players argue with the prompter, leading to a string of “ad-libs,” during which the projected translation titles have to stop, of course, since we are no longer in Goldoni’s play! Sometimes the actors interrupt each other. The Pantalone even tries to direct: “Piu moderno!” we hear from the side, to which the performer usually responds by starting over surprisingly (and hilariously) melodramatic. The three “old men” (the Pantalone, Dottore, and the innkeeper Brighella) are also fond of slipping into Verdi trios mid-scene. Is the “reality” of the setting the 19th century? or 1947, Strehler’s original premiere of the work? But, then, with the audience constantly acknowledged, how are we not also in 2005 at Lincoln Center, New York! Such mindgames are all built into the experience. Nowhere is the transparency of theatrical machinery more celebrated than in the play’s climactic tour-de-force dinner scene in Act II, where the title character must fool both masters in serving them each an “exclusive” dinner in the same hotel. While Arlecchino darts back and forth on the tiny platform, his fellow clowns are visible to the sides, at the ready with all the intricate food-props of this showpiece. (Yes, it is presented as a showpiece. No attempt at integration or illusion here.) We see all the handoffs of plates; we watch Arlecchino towel off his wet hands between each “trick”; and tossed bread shamelessly sails through slits of the painted backdrop, piercing what little pictorial representation there is. It is a perfect Bergsonian cuckoo-clock, yet never the kind of slick mechanization we’re used to, say, in modern French farce. It was more like a sporting event, actually, a gymnastics display where we applaud each feat and eagerly await the next. (And for a Brechtian like Strehler, the sports analogy is a compliment.) The “roughness” of it all—actor Ferrucio Soleri’s casual and effortless gliding through the moves—allowed even for the mistakes. (A few plates were dropped—but that's no big deal here). The 75-year-old Soleri is a marvel, of course. (He reportedly sweats through three Harlequin costumes a night—one for each act.) Having played the role for over forty years now (handed down by Strehler’s original actor before him), he is a link to the past the likes of which we rarely see on American stages. Soleri has now taken over the direction of the show, and to someone like me who has never seen previous incarnations of it, it’s impossible to judge how much is Strehler and how much Soleri. It definitely does not feel like a “remount”—there is nothing quaint or “museum piece” about it. While some of the business and adlibs may be new, one senses a loyalty to the spirit of Strehler, which is, of course, embedded into the very construction and concept of the production. We see why a strident Brechtian would embrace the commedia form—which is neither to pander or alienate the masses, by the way. This production for him was clearly one more step in his de-bourgeoisification of the theatre, stripping away the architecture of our (still) 19th-century trappings: the 4th wall, the suspension of disbelief, the privileging of spoken/literary text. Populist more than popular, the structure of political theatre was here even if not explicitly the content. (Though servant girl Smeraldina’s short diatribe against the double standards held for men and women, addressed flush to the audience away from her scene partner, came startlingly close.) The spirit of Strehler’s spiritual comrade, Dario Fo, was clearly in the house. And, finally, we can’t forget sheer beauty either. In a deceptively simple production (the “rough” play-within-play frame) Strehler transforms the final scene into something out of a Mozart opera—all candlelit and white-dressed. And, vanishing with a whimper, not a bang, Soleri, in Arlecchino’s “curtain speech,” snuffs out the antique footlights one-by-one, in a gesture breathtaking in its simplicity. Unlike the botched dinner for Arlecchino’s masters, our meal is served expertly and with dense richness. It is not dessert. Angus Podgourney, what -do-ye mean? !